General Dwight E. Beach, commander, United Nations Command, Korea, and Eighth U.S. Army, recently visited the division's Cu Chi base. Major General James H. Skeldon, chief, Marine Advisory Group, Korea, and Major General Myung Shin Chae, commander of Korean forces in Vietnam, accompanied General Beach. Major General J. O. Seaman, commanding general, II Field Force, Vietnam, also was with the party. The five generals toured the base camp and the surrounding area by helicopter. After their return they met with "Tropic Lightning" brigade and battalion commanders. They were briefed on search-and-destroy operations conducted by division elements to date. Operation "Wahiawa," one of the more recent of these operations. The 1966 Savings Bonds Campaign has been extended until June 30, "to assure that every civilian and military employee of the Federal Government throughout the world is given an opportunity to sign up for regular purchases" through the Payroll Savings Plan. The extension was announced by Postmaster General Lawrence F. O'Brien, Federal Savings Bonds chairman. The drive was scheduled to end May 31. Mr. O'Brien expressed confidence that the campaign goal of 75 per cent participation by Federal employees will be achieved. The postmaster general said "The 1966 campaign is the most extensive and intensive undertaken among personnel of the Federal Government in the 25-year history of the Savings Bond program." "Because of its worldwide scope we are just now gaining momentum outside the Washington area and, for that reason, I have concluded another 30 days are needed to reach everyone on the Government payroll with the Savings Bonds message." Lt. Col. Cannon Becomes New CO At 1/8th Arty. Lieutenant Colonel James W. Cannon assumed command of the 1st Battalion, 8th Artillery, in ceremonies held recently at the Cu Chi base camp. Col. Cannon took over the unit from its acting commander, Major Frank, E. Deam. During the ceremonies the men of 8th Arty. were read a farewell letter from the "Automatic Eight's" former commander, Lieutenant Colonel Robert G. Walker, who is on his way back to the United States for retirement. The battalion colors were presented to Col. Cannon and he returned them to the color guard as he took command. He then told the men of his new command that it was with great pride that he joined that unit. Col. Cannon was formerly assigned as intelligence officer for the "Tropic Lightning" Division. The Japanese Chamber of Commerce and Industry of Hawaii, in a resolution dated June 6, has commended the 1st and 2nd Battalions of the 27th Infantry, and the 1st Battalion, 8th Artillery, for their continuing support of the Holy Family Home in Osaka, Japan. Sidney H. Kasumoto, president of the chamber, mailed the resolution to Major General Fred C. Weyand, division commander. The Holy Family Home is an orphanage housing 175 children. Support of the orphanage, now in its 16th year, has included money, food, clothing and medicine. More than $440,000, or some $1,800 a month, has been contributed by the units to the home. Support started in December 1949, when the men of the 27th Inf. planned a Christmas party for the orphans. The 27th was stationed in Japan at the time. Some of the soldiers visited the orphanage and, noticing the misery and poverty, decided that one day of pleasure and 364 of hardship was not right. The project of full-time support was born then. The resolution conveys the chamber's deep and abiding respect and admiration for each and every individual of these celebrated units. The chamber also cites the officers and men for upholding the highest ideals of Americanism for both risking their lives in the defense of freedom and carrying on the tradition of support for the orphanage. The resolution also notes that, once again, these "Tropic Lightning" soldiers have proved they are "the finest fighting men in the world." NEW 17-MINUTE training film for orienting troops going overseas has been prepared by Army's Chief of Information office. The 16mm film covers overseas duty requirements and Code of Conduct. It will be available at end of June through Audio-Visual Service Centers under code AIF-16 (DA Pamphlet 108.9). Amateur pugilists, start your training! The division boxing program is scheduled to begin next month. Competition will take place in 10 weight classes for those fighters eligible under Amateur Athletic Union rules. There will be four teams consisting of the 1st Brigade, 2nd Brigade, Division Artillery, and Support Command With Division Troops. The matches will consist of three, two-minute rounds with one-minute rest periods. Points toward a team's first and second place trophy will be awarded on a 5-3-1 basis: five points for each fight won by a team, three for each fight lost by a team, one point for a forfeiture. A man will fight in one of four classes: novice, intermediate, experienced and open. He may change classes according to his performance. Details may be obtained through major commanders or the Special Services office. Sgt. Tony R. Arriaga, Co. A, 4/9th Inf. Sp4 Leon Black, A Trp., 3/4 Cav. SSgt. Haold K. Kinabrew, A Trp., 3/4 Cav. Sp4 Ronald S. Klonowski, A Trp., 3/4 Cav. 1st Lt. Eldon M. Wirtz, Co. A, 2/27th. Inf. SSgt. Samuel McCartney. HHC, 1/5th Inf. Sp5 Luis F. Ramos-Deliz, HHC, 1/5th Inf. SSgt. Alejandro D. Rendon, HHC, 1/5th Inf. Sgt. William F. Anders, Co. A, 1/5th Inf. PFC Jerry V. Arnold, Co. A, 1/5th Inf. Sp4 Monty L. Goree, Co. A, 1/5th Inf. PSgt. Willie Hicks, Co. C, 25th Med. Bn. Sp5 Sammie L. Kay, Co. C, 25th Med. Bn. Sp4 William J. Keener, Co. C, 25th Med. Bn. PFC Edward D. Logan, Co. C, 25th Med. Bn. PFC Kenneth A. MacDonald, Co. C, 4/9 Inf. PFC Anthony B. Mills, Co. C, 25th Med. Bn. Sgt. Theodore W. Mills, Co. A, 1/5th Inf. Sp4 Horace Mitchell, Co. B. 2/14th Inf. PFC Garfield H. Morgan, Co. D, 25th Med. Bn. PFC Loydell Payton, Co. A, 1/5th Inf. Sp4 Henry O. Powers, Co. A, 1/5th Inf. Sp5 Melvin J. Rhodes, Co. C. 25th Med. Bn. Sp5 Richard A. Spangler, Co. C, 25th Med. Bn. PSgt. Robert E. Victory, HHC, 4/23rd Inf. Sp5 Robert O. Walker, HHC, 4/9th Inf. Sp4 William A. Weir, Co. B, 2/14th Inf. Sgt. Allen R. Whitman, HHC, 2/14th Inf. Sp4 L. J. Willie, Co. B, 4/9th Inf. Maj. Walter Witala, Co. C, 25th Med. Bn. SSgt. Nathan B. Woolsey, B Btry., 7/11th Arty. Sp4 Kent C. Wright, Co. C, 4/9th Inf. During the past few weeks this page has offered a history of the enemy and his tactics in order that his ruses can be understood and avoided. Another facet of knowing the enemy is knowing how and why he thinks as he does. The "new kind of war" being waged today in Vietnam has its roots in an Oriental concept of war developed some 22,500 years ago. The philosophy was recorded in a 13-chapter book called "The Art of War," written by a Chinese, Sun Tzu. Sun Tzu's ideas have been expanded and refined by many men throughout Oriental history, including Red China's Premier Mao Tse-tung and General Giap, North Vietnamese military commander. Sun Tzu posits that the primary consideration of waging war is to know the enemy as well as yourself. He stresses the mental aspect of conflict. The primary target is the mind of the opposing commander. If his actions and reactions can be controlled or manipulated victory is assured. Of strategy, Sun Tzu says that winning 100 victories in as many battles is not a true sign of greatness, but that subduing the enemy without a fight is the pinnacle of skill. Thus, the strategy most important is to attack the enemy's strategy. The next best is to destroy his alliances, and then, only if neither strategy can be accomplished, attack his army. Sun Tzu suggests how a strategy of avoiding contact can be carried out. Plans and projects that cause injury to the enemy should be varied and diverse in both purpose and method. He suggests luring away the enemy leader's counselors and advisors. Or place agents in the enemy's important offices. Or use deception to alienate the enemy's allies from him. He maintains that it is always advantageous to capture a state or an opposing force in tact and without fighting if possible. Sun Tzu thinks that there is a psychological advantage in the strategy beyond the obvious material wealth to be gained. The overall idea of Oriental strategy is to win the battle before it ever takes place. Speed and deception must be used to bring off such victories or the chance to confound the enemy and make him helpless will be lost. Sun Tzu was a great believer in the value of intelligence and reconnaissance. His proposed uses of intelligence activities are remarkably applicable to the subterfuge of the Viet Cong. Secret agents were already a going concern in his day so his ideas on the subject are well founded. Tzu places the secret agent in five categories: native, inside, double, expandable and living. An example of a native agent would be a VC sympathizer who passes information to the communists. An inside agent could be a VC in an official government post. A double agent would be a South Vietnamese spy actually working for the Reds. The final two categories are indicative of the dispassionate Oriental philosophy of war. An expendable agent would be any unknowing communist agent who was leaked false information and then given over to the Free World forces where he could only reveal misleading information. Ironically, the living agent is anyone who returns alive with information. Sun Tzu says that the object of the secret agent is simply to determine what the enemy's plans are. He can do this by controlling the avenues of approach to the enemy leader, or can agitate him so he shows his hand. Although these thoughts are centuries old they are an almost perfect description of the way the communists are carrying on the war in Vietnam. By knowing the reason behind their methods it is possible to retaliate and thus reduce their effect. Cu Chi has become a haven for a number of mascots, pets, orphans, and plain old "camp followers." These animals are a source of pleasure for many Tropic Lightning soldiers. But caution and foresight must be exercised in order that a fuzzy puppy does not turn into a killer. Rabies is a disease of mammals. Because domestic animals can be controlled, the greatest danger of contracting the disease is from wild animals. Wild animals can infect a pet with rabies and the disease can then be transferred to humans by their own animal. Humans catch rabies when they are bitten or scratched by a rabid animal. Naturally not everyone dies every time they are scratched or bitten, but the threat of rabies necessitates medical attention every time an animal wounds a human being. Even pets will attack an owner without provocation if they are rabid. Unprovoked attack is a good indication that the animal may be sick, so preventative measures must be taken. The attacking animal must be watched for a period of four to five days to see if he displays the symptoms of the disease. If the animal cannot be quarantined a person might have to take preventative treatment without having the disease. The best way to guard against a pet catching rabies is to keep him from having any contact with wild animals. Pets can, and should, be inoculated against rabies and must receive boosters annually. Why Savings Bonds? That is one of the first questions a serviceman asks himself when he thinks of purchasing a bond. There are a number of good reasons for buying bonds. Perhaps the best of these is that they provide a nest egg for your future. No matter what your plans are, U.S. Savings Bonds can provide the money for you to attain your goal. U.S. Saving Bonds now have a higher interest rate than ever before. The new rate of 4.15 per cent means when you buy a $100 bond you pay $75 and receive $100 at its seven-year maturity. In addition to helping yourself, you are helping your country. You are investing in the future of your country and helping the national interest. U.S. Savings Bonds can't be lost or stolen. If anything happens to your bond it will be replaced free of charge. You always have your money waiting for you when you want it. When you buy a U.S. Bond your money is working twice. It is working for you and for your government. Want to pass along a real bargain? Tell your relatives and friends what a 5c stamp will do. You may now send mail from the U.S. to a serviceman in RVN for a nickel. The Post Office Department airmails it to San Francisco and the military services carry it to Saigon by air. This is one of the new services provided by the Army and Air Force Postal Service, operating under TAG. Be sure to tell the folks to address their letters accurately, including the 5-digit APO number. Also keep them advised of any change of address. If legislation pending before Congress is enacted, there will be further bargains. DONATION - A soldier of the 3rd Squadron, 4th Cavalry, carries a bag of rice to the hut of a Bac Ha villager during a recent civic action program conducted there. The rice was taken from Viet Cong caches during Operation "Wahiawa." In what was described by officials as "one of the largest single hauls of prisoners in the III Corps area," the reconnaissance platoon of the 1st Battalion (Mechanized), 5th Infantry, captured 19 Viet Cong and killed 11 more in less than an hour. The action took place recently during the initial hours of Operation "Makiki," a 2nd Brigade search-and-destroy mission near the Oriental River in Hau Nghia Province about 25 miles northwest of Saigon. From his command helicopter, Lieutenant Colonel Thomas U. Greer, battalion commander, of Gainesville, Fla., observed several Viet Cong running toward a hedgerow. He directed the recon platoon to move into the area. Specialist 5 Luis Ramos-Deliz, of Quebradillas, P. R., the track commander of the first armored personnel carrier (APC) to reach the location, said that his vehicle criss-crossed the area for nearly 20 minutes without finding a thing. Two more units from the platoon aided in the search. Sp5 Ramos said, "After looking without finding anything for a while, I stopped the track and got out. I was walking around the APC when I saw a 'Charlie' underneath it. The water was knee deep all over and in some spots where there were holes it was a lot deeper. The VC," Ramos added, "was hiding underwater and breathing through a reed." Once this discovery was made, the three tracks at the location stopped and the wet search began. Specialist 4 Terry Kessler, 23, of Hutchinson, Kan., said, "The only way you could find them was by stepping on them." Added Private First Class Milton Jones, 22, of San Antonio, Tex., "I'd been walking where the track had already been for 30 minutes. The water was up to my waist and the mud bottom made it rough going. I'd move along, spot air bubbles, yank the reed and up would come a 'Charlie'." The men from the first three vehicles accounted for 10 VC before the other four APC of the platoon arrived. Then, under the command of 1st Lieutenant James E. McQuinn, of Indianapolis, Ind., they swept the area and captured or killed the 20 other VC. Intelligence reports said that the 30 men captured or killed were members of a 50-man local guerrilla force. 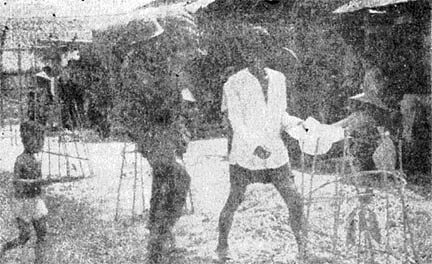 One of the captured men, who came out of the water with his bolt action Chinese carbine said he had joined the unit only a week earlier. The entire action took place without a friendly casualty. It might have been Al Hirt, or the Tijuana Brass, or the Hawaiian strains of Don Ho, but it was actually a pickup group from the 25th Division Band that entertained Company C of the 2nd Battalion, 27th Infantry "Wolfhounds," when they returned from Operations "Wahiawa" and "Makiki." The company mess sergeant, Staff Sergeant Ronald K. Auld, of Honolulu, Hawaii, regularly arranges the welcome home party with a friend of his in the band, and the cooks go all out to prepare a feast for the tired infantrymen. Between renditions of "Downtown" and "I Wanna Go Back to My Little Grass Shack" the "Wolfhounds" wolfed down charcoal grilled steaks, vegetables, fresh rolls and cake, and plenty of cold drinks. As the band played on, the men broke into smiles, forgetting the troubles of the battlefield - until the next operation - and welcome home party. BABY-SAN - A young Vietnamese girl holds her little sister who has just been treated by division medical personnel. The pamphlet she is holding explains the medical service, one of many included in the civic action program. The reconnaissance platoon From Headquarters Company, 1st Battalion, 27th Infantry, discovered a Viet Cong hand grenade factory which they estimated being capable of producing 400 to 500 grenades a week while on Operation "Makiki," 10 miles southwest of Cu Chi last week. 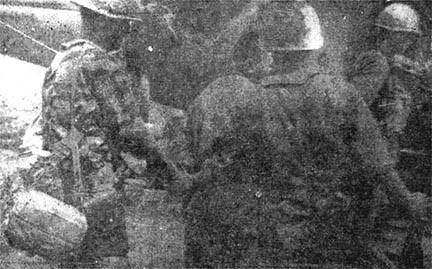 The platoon leader, Staff Sergeant Bertram W. Fritz, of Cincinnati, 0h., said the factory probably supplied all the VC units in the area. It took two days for Sgt. Fritz and his men to reach the factory due to extensive booby traps and land mines surrounding it. Sergeant Jerry Whitehead, of Talahassie, Tenn., platoon scout section leader, said the men found about one thousand booby-trapped grenades surrounding the factory. Once they reached the factory the platoon found a cache of sulphur, which the grenades are believed to be made of, casts, forging tools, and a supply of blue handles for the grenades. Sergeant Thellie Casper, of Aulander, N.C., team leader, said the grenades smelled like sulphur and were not too powerful but found their score. The men suffered several injuries while clearing, the area. It is believed the VC knew the "Wolfhounds" were coming and used the grenades for the booby traps which the platoon encountered. After the area was cleared and the equipment confiscated, the "Wolfhounds" destroyed the large concrete building which housed the factory. "Dustoff coming in!" The radio call spurs the men of Company B, 25th Medical Battalion, 3rd Brigade, to prepare for the reception of patients. On Operation "Paul Revere," elements of the task force met heavy contact with what they now know to have been a North Vietnamese regiment. "Every wounded man who reached our hospital alive, reached the next higher echelon alive thanks to the finest doctors I have ever worked with," said Captain William Gardner, the "Bronco" Bde. surgeon. All patients suffering head or eye injuries were immediately evacuated to Pleiku or Qui Nhon. Other patients requiring major surgery are evacuated either to Pleiku or An Khe. "A seriously wounded man can be on an operating table in Pleiku within a half hour after he reaches us," stated Edward Denison, the Company B commander. "Although we have full surgical facilities, we don't use them unless it is a dire emergency," Capt. Gardner pointed out. "We hold all patients we feel we can get back to duty within a week. All others we evacuate," Capt. Denison said. The company holds an average of 30-35 patients per day. The doctors voiced great respect and admiration for the dustoff pilots and medics. "They have lost two choppers during this operation while attempting to extract wounded soldiers from the battle areas," Capt. Gardner emphasized. "They also had a medic shot in both legs." The dustoff unit supporting the 3rd Bde is the Pleiku platoon of the 498th Helicopter Air Ambulance Company. "This dustoff system is the major reason that this war has such a low mortality rate. Lower than any other war. There is less than two per cent mortality after the casualty reaches the first medical facility," Capt. Gardner noted. Platoon Sergeant Konelio Pele is now fighting his third war and he says this one is worse than any other. Having, seen much action with his unit, Company A, 1st Battalion, 35th Infantry, during Operation "Paul Revere," he speaks from experience. In describing some of the differences between this and his other two wars, Pele observed, "In the other wars you knew where the front line was, in this one they hit you from everywhere. You face the front, send out a patrol, and get hit from the rear. You turn to the rear and fight the people behind you, and you get hit from the front. You've got to sit right there in the middle." According to the sergeant, "The main thing when you take the patrol out is to tell your people what they're supposed to do if you get hit from both ways. You've got to split your squad so that half fight to the front and half to the rear." Twenty-Fifth Infantry Division soldiers made the largest capture of arms and ammunition in many months and killed 21 VC during Operation "Makiki," which ended last week. The week-long search-and-clear operation took place 30 miles northwest of Saigon in Hau Nghia Province. Thirty-two Viet Cong and 53 suspects were captured by the "Tropic Lightning" soldiers. Arms and ammunition taken included 110 small arms and 57,740 rounds of ammunition. The VC also lost 26.4 tons of grain, 47 sampans, 43 tunnels and 29 buildings. 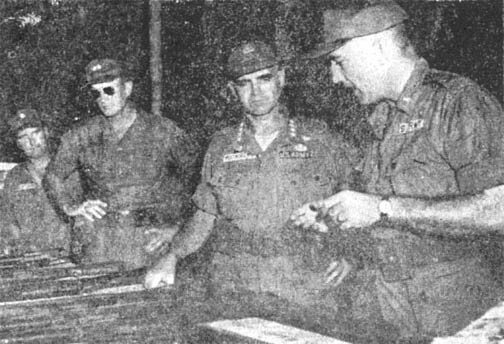 General William C. Westmoreland, commander, U.S. Military Assistance Command, Vietnam, made a special trip to inspect the captured material, calling it a fine accomplishment by the 25th. As with all operations, this Medical Civic Action Program (MEDCAP) and the "Tropic Lightning Helping Hands" project were used on Operation "Makiki,". MEDCAP physicians treated 491 patients in the operational area while "Helping Hands" distributed a half ton of rice, 1,700 pounds of clothing, 430 bars of soap and 50 dental hygiene kits. Division spokesmen, assessing the results of the operation, said "Makiki," deprived the Viet Cong of much weapons and ammunition, hopefully preventing them from causing significant difficulty in the near future. General William C. Westmoreland, commander, U.S. Military Assistance Command Vietnam (MACV), visited the division last week and inspected captured Viet Cong arms and ammunition taken on Operation ""Makiki,"". The captured equipment included small arms, automatic weapons, high explosives and ammunition. The majority of the weapons captured were Chinese but much of the ammunition was of Russian manufacture. Major J.C. Baker, technical intelligence officer for MACV, in briefing General Westmoreland, said that this was the first time Russian ammunition had been captured in any large capacity. 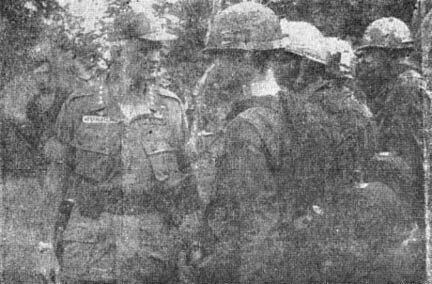 General Westmoreland visited the 1st Battalion (Mechanized), 5th Infantry, the unit that captured the material. He presented Army Commendation Medals to Captain Willie A. Blair, Sergeant James W. Ivey Jr. and PFC Cleo O. Ford, the men who discovered the cache. The general expressed his pride in the three men's achievements and urged them to continue to display the aggressiveness and determination that had marked their unit in the past. "Searching" is just what the reconnaissance platoon of the 1st Battalion (Mechanized), 5th Infantry, has in mind for the Cong and they'll even swim a river to get their man. This was proven on Operation "Makiki," a search-and-destroy mission near the Oriental River in Hau Nghia Province. Operating 30 miles northwest of Saigon, the men used nearly every means of locomotion known in Vietnam to run down the Viet Cong. When the command and control helicopter spotted some VC, the armored personnel carriers (APC) went after them. When the APC's were stopped by the waist-deep water and mud, the men waded. When the mud gave way to small ponds and canals, the "Bobcats" started swimming after the VC. Swimming became impractical because the Cong had too much of a head-start down a canal so the recon team commandeered a sampan and poled their way down the stream. Said one soldier, "I've taken the point before, but this is the first time I did it from the bow of a sampan." The "Tropic Lightning" 3rd Brigade Task Force continues to sweep the area west-southwest of Pleiku on Operation "Paul Revere." Since the operation began more than a month ago elements of the brigade have accounted for 279 North Vietnamese and Viet Cong killed. Air strikes in support of the operation have netted 43 more enemy dead. 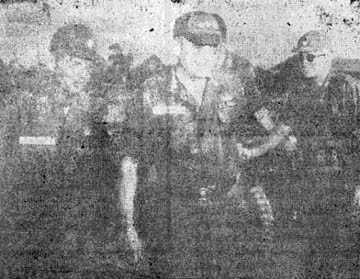 Thirty soldiers of the North Vietnamese Army have been captured in action and four "Chieu hoi" have come over to the government. Most of the action occurred during an encounter 2 1/2 weeks ago which saw men of the task force in heavy engagement with what was later estimated to be a North Vietnamese regiment. The Communists broke contact and withdrew to the west. Contact has been light since that time. A total of 68 small arms and 49 automatic weapons have been captured by the "Broncos" in addition to large quantities of ammunition, rice, barley and salt. Three hundred ninety-eight huts, 42 bunkers and 17 tree-houses have been destroyed. The 3rd Bde. Has suffered light casualties overall during the fighting, but several small units have had moderate casualties. The 2nd Battalion, 9th Artillery, boasts of one of the most charged batteries in Vietnam. During the 3rd Brigade's recent heavy contact with the North Vietnamese Army units, additional firepower was needed. 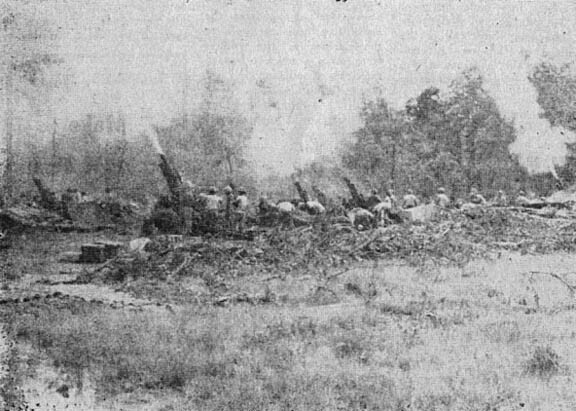 As a result, Battery A, of the "Mighty Ninth," was brought into action. During one afternoon and night they expended more than 1,500 rounds. Because of the heavy enemy fire coming in on the infantry companies, the battery fired for 24 hours without a break. All the while small arms and mortar fire were falling on the battery. The action recently took place on Operation "Paul Revere." 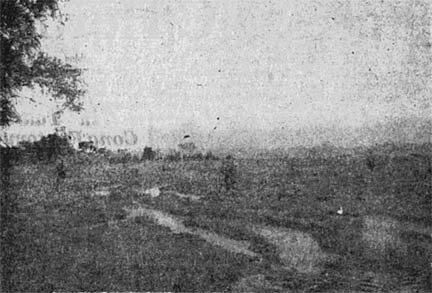 First Lieutenant Richard Higgins, who was commanding the battery at the time, had this praise for his men: "It really made me proud to see the men in this battery because they were up shooting their howitzers to save those other men (infantrymen) at the same time the mortar rounds were landing in this area." "Golden Dragons" of the 3rd Brigade recently captured a Vietnamese dragon on Operation "Paul Revere." 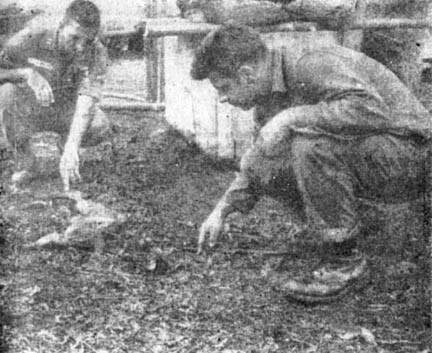 Men of the 1st Battalion, 14th Infantry, "Golden Dragons," dragged in a four-foot iguana found wandering near a 3rd platoon Company B, surveillance post. The men thought the iguana would make a good mascot. The company's commanding officer, Captain Richard Barry, agreed and presented the animal to Lieutenant Colonel Gilbert Procter, battalion commander. The new found "dragon" reminded the colonel of a cartoon character that had appeared in the battalion newspaper and he named the iguana "Danny Dragon." Danny now resides near the battalion command post tied to a nearby tree by a rope attached to his harness. The men of the battalion built a hootch for him. There are, however, problems that must be dealt with when an iguana is your mascot. Within a few days after Danny arrived at his new home several men had to spend the better part of an afternoon extracting him from the crankcase of a jeep where he had become lodged. 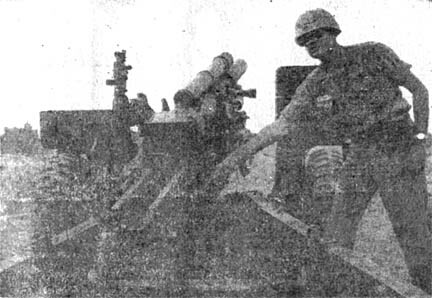 Taking a page from the Viet Cong manual, 3rd Brigade has added five North Vietnamese anti-aircraft guns to its arsenal. But, as Company B, 2nd Battalion, 35th Infantry, found, stealing "ack-ack" guns from the Communists isn't quite like filching oranges on the block; the guns almost stayed with their original owners. The company, in the middle of Operation "Paul Revere," was airlifted into a landing zone which turned out to be a hornets' nest. Before the choppers could set down, the first wave received heavy enemy fire. Company B returned fire and immediately counterattacked the enemy stronghold. Battalion Commander Lieutenant Colonel Philip Feir had this assessment of the combat assault, "We feel very fortunate to have gotten them (the assault force) into the landing zone at all because we rounded up five 12.7mm anti-aircraft weapons in the landing zone. As a matter of fact, we were able to get into those positions in two cases before the North Vietnamese Army soldiers could get into the weapons area themselves." Col. Feir pointed out that these were the first anti-aircraft weapons that the 3rd Bde. Task Force has captured. Toting handbags and wearing hats to keep the sun out of their eyes, more than 1,000 Vietnamese men, women and children crowded into the division's amphitheatre recently for a celebration in their own honor. It was Laborer's Appreciation Day and Vietnamese workers in the Cu Chi base camp were treated to both American and Vietnamese entertainment, in addition to a big feast. Members of the "Tropic Lightning" band opened the show with a variety of old, familiar tunes, including many favorites from Hawaii. The highlight of the day's festivities came when a Vietnamese cultural show took the stage and captivated their own people with everything from clown acts to dancing girls. Adding to the color of the occasion were Vietnamese folk dances and even a Vietnamese version of the Beatles. The cultural group, a traveling show sponsored by the 6th Psychological Operations Battalion, is designed to show the Vietnamese people some of their own culture. The food for the big, noon meal was prepared by Army cooks, who also enlisted the aid of two local chefs. After the celebration, the workers were given a ten kilo bag of rice, canned milk and the rest of the day off. Laborer's Appreciation Day was set up at the request of Major General Fred C. Weyand, division commander, to show the Vietnamese employees how much the 25th appreciates their work. Major Edward F. McManus, project officer for the "day," assembled a small task force to insure an enjoyable time would be had by the 1,000-plus men and women. Preparation of the fried rice, assorted cooked and raw vegetables, tea (iced), and an American addition to the menu, a huge chocolate cake, was the responsibility of cooks from the 25th Military Police Company and 25th Supply and Transport Battalion. Captain Tung, a Vietnamese liaison officer with the division, said, after the last of the several hundred pounds of rice and other food had disappeared, "All the laborers were very appreciative that the 25th Division thought so much of them to give them this day." Rain, hail, sleet and snow - common hazards of mailmen the world over. Outside of an occasional unhappy dog, however, the risks are minimal in delivering the mail. But Army postmen have most of the usual problems - and hordes of mail-hungry customers virtually threatening bodily injury besides. Specialist Four Joe W. Collins, of Clarksdale, Miss., mail clerk for Headquarters and Headquarters Company, 2nd Brigade, is representative of the harried lot of a military mailman. While Collins has only 200 patrons, occasionally he feels as if he has half the division baying outside his mail room. "When the mail is late, some of them are very impatient," Collins says. "A lot of them don't like to wait. One time I was just bringing in the mail when someone asked me if he had any mail. I'm not sure how I was supposed to know when it was still in the postal sacks." But when the mail fails to arrive, Collins plants his feet firmly on the ground to withstand the withering barrage from the men. Some of them joke with me when they don't get any mail," the 23-year-old Collins remarked. "They'll tease me and tell me I'm holding back their mail. They see me during the day and holler, "Collins! Where's my mail?" But it can become a trying, job when his stomach is affected. On one occasion, Collins was walking through the mess line when one of the cooks dropped his serving spoon and yelled, "Hey, Collins! I didn't get any mail today. I'm not going to feed you if I don't get any tomorrow." But the long-suffering mail clerk is still eating. "If they don't get any mail, I tell them that I'll write them a letter," he said. "All they want is someone to write to them." Collins, smiling wryly, claims the problem of those not receiving mail could be alleviated "if all those lovely, young girls in America would just send their addresses to me." As it is now, he receives letters addressed to "Any GI in Vietnam," and the limited supply immediately disappears. Collins job must, of necessity, be one of devotion for he frequently is up until late hours at night sorting mail, while the rest of the company enjoys the nightly movie. But he manages to take most of the ribbing in stride with a good natured shrug. "It isn't too bad," he observes. "At least as the unit mail clerk I can be assured of seeing all of the men every day. I don't have to worry about finding them because they always find me" - in spite of wind and dust and monsoon rain. A primitive water fountain recently drew the attention of a 3rd Brigade civil affairs team conducting a sick call in the village of Plei Jong Le and prompted the construction of a modernized water system for the village. The members of the teams were treating the sick when they noticed a woman getting water from an underground stream through a single, small bamboo reed. Talks with the village chief and residents of the village that afternoon revealed that they all wanted a new water system but did not know how to go about improving the old method. With the advice of the civil affairs team, three, four-foot pipes supplied by the U.S. Agency for International Development and the enthusiasm and hard work of the villagers themselves, a new spillway was constructed. The new spillway greatly increases the volume of water that could be obtained from the stream. Letters of thanks from local Vietnamese continue to he received by division headquarters. The most recent letters, from the chief of Khiem Hahn District and chief of Ben Vang village, were sent to thank the division for a donation of over 18,000 pounds of rice. This donation of rice, captured from the Viet Cong on Operation "Wahiawa," is part of the overall program of civic assistance extended to the people in the division's area of operations. The letters put special emphasis on "Operation Helping Hand" which has provided daily necessities, including clothing, soap, toothpaste, combs, mirrors, food, etc. They state, in part, "Almost all of the people in this area are very poor and the help of the 25th Division is good and necessary... My people receive these gifts with great happiness. Today the great help of the American people and the 25th Division has proven that the Americans are sincere in their desire to help the people of South Vietnam. "Before the 25th's arrival, the Viet Cong spread propaganda. The National Government would call the people to work for them as laborers and then would force them into the army." The letter continues, "but everything was to the contrary. The U.S. Army built roads and bridges . . . made it possible for our children to go to school and for our sick to be cured." He's red-haired and freckle-faced and he goes out on ambushes and patrols like others in the 2nd Battalion, 27th Infantry. But one thing holds Private First Class Paul Widtfeldt apart from the others: he won't carry a weapon. PFC Widtfeldt is one of 11 conscientious objectors in the 2nd Brigade and like the others, he works as a combat medic. "Lots of` people have the idea that if a man doesn't carry a weapon he's no good," said Specialist 6 James H. Warner, the 2/27th medical platoon sergeant. I've got three CO's (conscientious objectors) now and they're well liked. They take care of their men, and that's what counts." PFC Widtfeldt talked freely shout his religious beliefs. "The Bible says 'Thou shalt not kill.' and because I was raised to follow the Bible, I can't carry a weapon." He belongs to a non-denominational religious group, which he says, "the government has named Plymouth Bretheren. Probably because its origins are in Plymouth, England." His parents live in Council Bluffs, Iowa, and his father was a CO in World War II. "I feel the same as everybody else in combat - scared. But I can't carry a weapon. My only protection is my faith in God. His will comes first. "God allowed me to come to Vietnam, but I have no right to expect Him to preserve me," the 21-year-old PFC firmly added. Does he pray for help? "Yes, I pray and ask God to preserve me - if He sees fit to do so," answered the devout medic. The men of Company C, for the most part, accept his beliefs. "I'd rather have them ask me questions than stand back and wonder," he says. "Some of them object to the fact that I won't pick up a weapon and start shooting if I've no patients to take care of. But I think most of them try to understand." Men who've been in action with PFC Widtfeldt have nothing but the highest praise for him. One said, "We were once pinned down and there was lead flying all over the place. Someone yelled, 'Medic,' and Paul jumped up and started moving. He kept walking and saying 'Don't worry, I'm coming. Just keep talking to me so I can find you.' And all the while bullets were flying all around us." "Even when we're marching from one command post to another PFC Widtfeldt gets no rest. When we stop he's always running up and down the line passing out salt tablets and checking our feet. He never seems to get tired," added the rifleman. All of the verified conscientious objectors entering the Army are sent directly to basic training at Ft. Sam Houston, Tex. There, they undergo six weeks of normal basic drill, PT, bivouac and infiltration course. The only thing they don't do is familiarize with weapons. Since coming to Vietnam five months ago PFC Widtfeldt has gone on dozens of reconnaissance and ambush patrols, and treated many wounded men. If anything, he feels his faith in God has been strengthened by the experiences. "I'll continue to do what I have been doing. I won't change. I've been raised to believe in God, and the way I see it, I have no right to try and protect myself if it means defying one of God's commandments." 'There'll always be wars and rumors of wars," says PFC Paul Widtfeldt, citing Luke 21, "and although it's against my beliefs to fight, God willed me here. And I'll do my job." Tunnel complexes discovered by American forces in Vietnam have been known to contain many things, but recently the 1st squad, 1st platoon, of Company A, 2nd Battalion, 27th Infantry, discovered a new use the Viet Cong made of tunnels. Led by Sergeant Juenito Felix, the men of the 1st squad were conducting a combat patrol along the Oriental River two miles southwest of Cu Chi. Late one night the men heard sounds like a baby crying and a man moaning. They decided to wait until the morning to investigate. As the sun rose Sergeant Felix and his men searched the area for the source of the sounds they heard the night before. As they searched the area they discovered what turned out to be an underground hotel. The men found three tunnels leading to three small rooms containing seven bamboo beds, a kerosene lamp, a bottle of kerosene, and a long knife. From the main tunnel an air shaft protruded up six feet and was covered by a jar on the ground above. As Sergeant Felix explained, the creek nearby could have been a mooring point for river traffic and the tunnels an overnight stopping point. When asked about its possibly being a VC tunnel, Sgt. Felix said it could have been used by the Viet Cong, friendly civilians or Army of the Republic of Vietnam dependents. He said it was apparent that people had slept there the night before. The squad also searched a nearby hut and found a sign which read "The Viet Cong are against the people." Captain Billy J. Hammonds is a big man with a big job. The 31-year-old officer's 6 feet 5 inches and 230 pounds are ample qualifications to get his job done as the new S-5 for 1st Battalion (Mechanized), 5th Infantry. Capt. Hammanda, from Talladega, Ala., is a quiet man who likes his work - helping the South Vietnamese villagers who live near Cu Chi. Cu Chi District is surrounded by numerous small villages and hamlets, including that of Ben Do, located four miles south of Cu Chi on Highway 1. Capt. Hammonds is responsible for the welfare of the 1,000 men, women and children who call Ben Do their home. Last week, Capt. 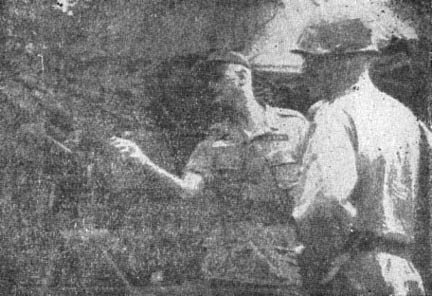 Hammonds, accompanied by 1st Lieutenant Donald Thompson, an English instructor, visited the village chief to make plans for aiding the Vietnamese. Sitting in the shade of an open-faced store and occasionally brushing flies away with his big hand, Capt. Hammonds discussed the needs of Ben Do residents. Through a Vietnamese interpreter he explained, "We would like to teach the children English. Is this possible and when may we start?" "That would be fine," the 40-year-old chief replied. "We are not ready today, but if you can come back in a week, the children will be at the school." A young girl brought in tall glasses of beer and soft drinks and the discussion went on to other areas. The village needed a well. Capt. Hammonds agreed to help them build a public well and latrine facilities. When he learned that a maternity home was needed, the captain said he could provide cement and bricks to accomplish the undertaking. "The village has 104 pigs," commented Capt. Hammonds. "We rounded up about a fifth of them from our base camp area. They were just running wild and getting in the way. So we donated them to Ben Do. Now the villagers are having problems feeding the pigs." But after each meal there are plenty of scraps at 1/5th. Before he left the village, the captain said he thought he could deliver a truckload of garbage several times a week. The leftovers would not go to waste, and, after treating and cooking, would provide excellent hog food. 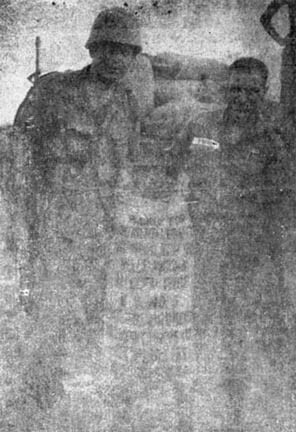 BIG MAN - Captain Billy J. Hammonds and 2nd Lieutenant Joseph V. D'Orso of the 1st Battalion (Mechanized), 5th Infantry, display one of the captured bags of rice to be distributed to needy villages. It cost the Viet Cong 50 to 60 tons of rice in Operation "Wahiawa" when they let a group of jungle hooligans hit a VC storage cache. The 3rd platoon of B Company, 2nd Battalion, 14th Infantry, was securing a route of march from Cu Chi to a command post in the Ho Bo Woods. They had the usual problems of a patrol: the red ants, the sticky mud of the rice paddies, a sniper or two, but nothing out of the ordinary. On the alert for snipers, booby traps and punji pits, the men spotted a rice cache hidden in the jungle. The rice bags were found to be booby trapped in four places. Members of Company A, 65th Engineers, removed the explosives so that the 25 to 30 tons of rice could be secured. It was decided to return for the rice on the next day so that the battalion could continue moving. When the platoon arrived in the area early on the following morning, Private Ernie Santa Cruz discovered an additional cache of rice as large as the first. Lt. Muir reported the new find and was told to carry all the rice he could and destroy the rest. B Troop of the 3rd Squadron, 4th Cavalry, supplied 13 armored personnel carriers and the double cache was loaded in six hours and brought to Cu Chi. The captured rice is now helping to feed the families and men of the Army, Republic of Vietnam, as part of the 1st Brigade's civic action program. Don DeFore, who starred with Shirley Booth in the "Hazel" television series, recently visited the 25th at Cu Chi as part of a two-week tour of Vietnam military bases. Mr. DeFore was recognized by many soldiers as the harried Mr. B. (George Baxter) as he toured the base camp. During the tour, Mr. DeFore stopped to speak to the men of different units. He concluded his visit at the hospital, where he shook hands and chatted with the patients. Mr. DeFore has appeared in many movies and has several businesses as well as having worked in the "Hazel" series. His name is Minh. He is 12 years old and lives in the hamlet of Ap Trang Cun. I met him while on a search-and-destroy mission with the 4th Battalion, 9th Infantry, about 10 miles northwest of the base camp at Cu Chi. They had set up a road block and, with the help of some Vietnamese National Police, were checking travelers for possible Viet Cong. While observing the proceedings, someone walked up to me and said, "Hello, GI. How are you today?" I looked down and saw a little boy not quite as tall as my M-14 rifle. His black hair fell across his forehead and hung around his ears. His white teeth sparkled in a big smile. "I'm fine. How are you?" I said. "My name Minh. Live Ap Trang Cun. Mama-san in Cu Chi, wash clothes for Merican GI." We sat down on the bank beside the road and I asked, "Where did you learn to speak English?" "Merican GI," said Minh. "Teach good. Minh learn fast, you wait. Minh come back soon." He ran down the road and into a house. In a minute he was back with a big bunch of bananas. He offered me one; I took it and thanked him. As we ate I questioned: "Minh, what do you think of the war?" "War good. Merican kill VC good." "Do the VC come around here much?" "What do you think of American soldiers, Minh?" "Merican number one. 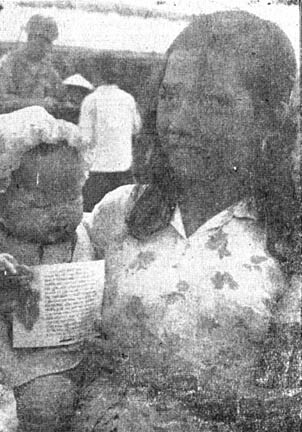 Minh hurt in Cu Chi. GI come, fix good." A soldier with a bandage on his arm walked by and Minh stopped him. He pointed to the bandage and said, "VC boom boom?" "Yeah," said the soldier. "VC boom boom." Minh pointed to a three-inch scar on his own leg and said, "VC boom boom. Merican number one, VC number ten." "Have you seen any VC?" I asked. "VC come. Boom Boom, kill, take rice. Number ten." The little man had analyzed the overall situation very well for his 12 years. When asked if the government forces would win the war, Minh thought for a minute, then looked up at me and said, "VC number ten: GI number one. No sweat." I gave Minh a piece of candy and he gave me a piece of gum and then it was time to go. The unit was moving down the road so I fell in line. I looked back over my shoulder and waved to Minh and he waved back. As we walked away, I felt good when I thought of the confidence in that little boy's voice when he said, "VC number ten; GI number one. No sweat." In a certain state there is no speed limit for automobiles on the open highway. One day, in this state, a highway patrolman stopped a man who was going 95 miles an hour around a curve, and cautioned him about speeding. The driver's answer was: "This is a free country - I can drive as fast as I want." In a small town in another state lived a man who belonged to an unpopular minority political party. This man published a small weekly newspaper in which he upheld his party's views, and constantly criticized local government officials. One day he was visited by a group of citizens who told him that the community wanted no part of him or his newspaper and that he must stop publishing it. His reply was similar to the driver's: "This is a free country - I can publish my opinions if I want to." Most Americans will agree that the driver was wrong and the publisher right. But why? Both were appealing to the individual's freedom to do as he wishes - and this is a freedom most Americans value very highly. Neither man was breaking the law. What, then, the difference between the two situations? Where do we draw the line between freedom and abuse of freedom? The difference lies in the effect the two actions have on other people: No one is forced to buy the newspaper expressing the unpopular political views, or to believe it if he does buy it and read it; the public is free to accept or reject it. And if anyone thinks that the views expressed in the paper are really harmful, he is at liberty to publish his own beliefs and arguments through whatever medium he can command. In short, in getting out the unpopular newspaper the publisher does not violate the rights of anyone else in the community. The man who drives 95 miles an hour around a curve does, for everyone has a right to life, and this right is clearly placed in danger if automobiles are driven in a reckless fashion. A pedestrian or another driver does not have the freedom to decide whether or not be will be hit by the speeder. Freedom, then, does not mean the absolute right to do anything one pleases. There are restrictions that we all accept as necessary and desirable. Freedom gives you power. It gives you the power to make your own choice, and also the power to hurt others by the choice you make. Like a pistol, it is a good thing only so long as it is in responsible hands. 1. Say what we want. 2. Worship as we please. 3. Do as we will. 1. To respect the liberty of others. 2. To further the welfare of the community. 3. To protect the security of the United States. Three basic freedoms and three basic responsibilities - and each is meaningless without the other. As the war develops so do many jobs that were not needed during training. Retrieving wounded helicopters downed in the thick jungles of Vietnam is one of these jobs. Company E, 725th Maintenance Battalion, is responsible for this recovery. The job is tough and often dangerous. Two UH-1D choppers, complete with replacement parts, tools and a highly skilled stand-by maintenance crew, are ready 24 hours a day for the call that summons them into action. The pilot on duty receives the call from the tower, giving him the location of the downed chopper and a brief analysis of the problem. With this additional information, the pilot gathers any additional equipment or specialized personnel needed to accomplish the job. If the recovery area is not secure, a fire team of armed helicopters accompanies the maintenance crew to afford protection while they work. While the fire teams criss-cross overhead, the maintenance crew goes to work, probing, searching, replacing parts in the greasy innards of the downed chopper. If at all possible, they repair it in place and fly it back. If the damage is extensive or enemy fire grows too intense, a big Chinook CH-47 helicopter is called in to evacuate the wounded chopper. A harness is placed around the chopper and when the CH-47 arrives, the helicopter is sling-lifted back to the base camp, where another crew of mechanics repair the damage. Major General C.C.Turner, Provost Marshal General, Department of the Army, recently visited the division base camp at Cu Chi as part of a tour of U.S. bases in Vietnam. General Turner was met at the Cu Chi Army Airfield by Lieutenant Colonel George Black, 25th division provost marshal, and Major E.M. Nix, Assistant division provost marshal, who escorted him to division headquarters. There he met with Major General Fred C. Weyand, division commander, and Colonel Thomas W. Mellen, division chief of staff to discuss the problems involved in dealing with black marketeers and prisoners of war. General Turner then toured the 25th Military Police Company area and the prisoner of war facilities at the "Tropic Lightning" base camp. No new recommendations on an overhaul of the Selective Service System have been made to Secretary of Defense Robert S. McNamara, officials said in answer to published reports. The secretary covered several aspects concerning the draft in his FY67-71 posture statement. "In the draft study presently being conducted by Department of Defense (DoD)," officials said, "various lottery systems are being considered along with many other alternatives." It was pointed out by DoD officials, "The desirability of selecting draftees at a young age, such as 19, has been widely discussed within the study group, but no recommendation concerning this has been made." Supplying 5,400 people with the basic necessities and required services is no easy job, encompassing everything from treating wounds to delivering steaks for supper. It is the responsibility of the 3rd Support Battalion (Provisional), which supplies logistical support to the 3rd Brigade Task Force. The battalion keeps the brigade and its equipment functioning with personnel drawn from support elements within the division. Because 3rd Bde. operates as a separate unit it was desirable to combine the support elements to form a smaller version of the brigade-size division Support Command. Modern data processing methods recently went into use at the brigade, using a key punch system for requisitioning items. Cards are punched at Pleiku and sent to Qui Nhon for processing. From Qui Nhon they are sent out to the appropriate supply agency. The battalion, through its Qui Nhon liaison office, requisitions all supplies directly from the Army depot there. 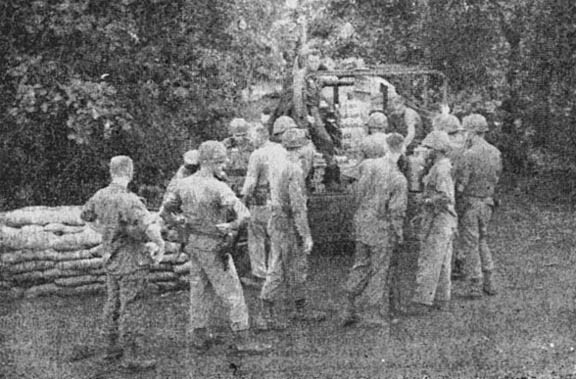 Supplies are trucked into Pieiku and then shipped to the field, where a forward support element is maintained. In order to do its job, the battalion stocks approximately 15,000 different items ranging from whole blood to tank engines along with a ten-day supply of automotive gas and diesel fuel to run the engines. Also in stock are A, B, and C rations. A Northbridge, Mass., man recently became the first in his organization to re-enlist since the unit was deployed to Vietnam. Master Sergeant William A. Farley, with 18 years service in the Army behind him, took the oath once again for three years. Sgt. Farley, assistant operations sergeant with Headquarters Battery, Division Artillery was with 1st Battalion, 73rd Artillery, at Ft. Hood, Tex., before joining the division at Schofield Barracks, Hawaii prior to deployment to Vietnam.